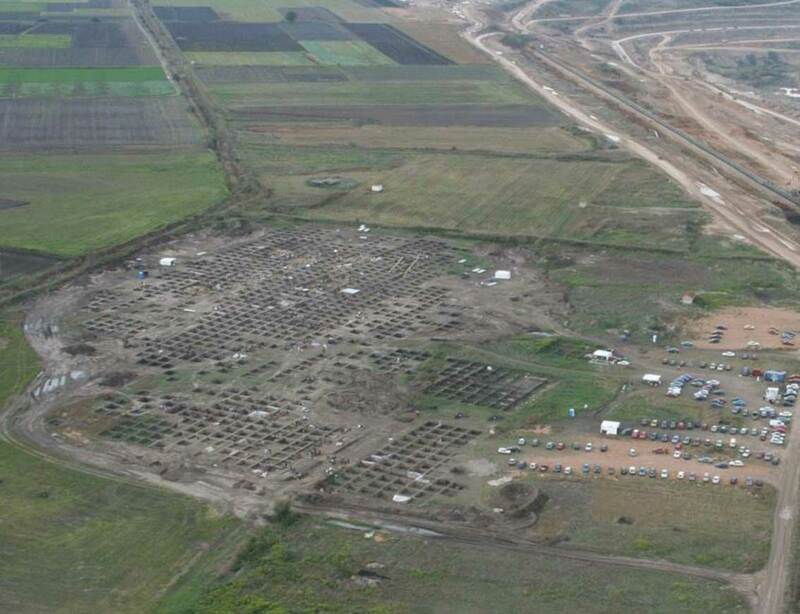 Aerial photograph of the Neolithic settlement at Kleitos, Macedonia. Christina Ziota (Ephorate of Antiquities of Florina) will give a lecture entitled “Rescue work and archaeological research at Kleitos, Kozani: The Neolithic settlement through space and time. The diachronic use of the site”. The lecture is part of the Aegean Lecture series organized by Aegeus – Society for Aegean Prehistory and the Swedish Institute at Athens. The archaeological site at Kleitos is situated in the basin of Kitrini Limni (Yellow Lake), in a short distance from the town of Kozani. It was inhabited from the second half of the 6th millennium until the 2nd millenniu, BC, and then again during historical times. From 2006 until 2010 a rescue excavation took place at the site in advance of expansion of the lignite mine operated by DEI (Public Power Corporation). The excavation covered 7.5 hectares and has brought to light two Neolithic settlements (“Kleitos 1” and “Kleitos 2”), remains from the Bronze Age Period, late Roman burials, a stone building of historical date as well as a number of movable finds dating from the Hellenistic till the early Byzantine Period. “Kleitos 1” is a flat, sparsely built settlement and covers an area of 2 hectares. It is bounded by a system of ditches and wooden enclosures. It is bounded by a system of ditches and wooden enclosures. It was inhabited during the early Late Neolithic Period (second half of the 6th and the beginning of the 5th millennium BC) and has been almost completely excavated. The settlement “Kleitos 2” is located less than 100m away. It covers an area of 0.25 hectares and has up to three building phases. It was inhabited mainly in the late Late and Final Neolithic Period. From the Middle Bronze Age a curving ditch has been preserved with large quantities of pottery together with a deposit containing a similar context. In addition a pit was found with remains of a ritual activity.